Participate on the Blog by answering the polls, commenting, giving feedback, and joining our club. Movie soundtracks are available for members. Whats Your Favorite Critters Film? How to join on the message board. 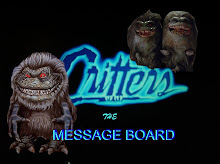 Send us your email and tell us what your favorite critters movie is! Krite rewards are rewards the blog sends out to members. They could include tracks from the official soundtrack, pictures, etc. Join the blog and recieve them!